Detailed Figure Skating programme here. For Invitation and Official Programme of Figure Skating click here. Figure skating is a beautiful yet demanding sport. Its modern roots can be found in Europe (Great Britain, Netherlands, and Denmark) and Russia, at the end of the 18th century. From frozen ponds, the figure skating gradually moved onto rinks, and entertainment became a sport. The first World Championship was held in 1896; with the European Championship added as of 1930. As a discipline, figure skating has undergone extensive development, both in performance assessment and the sports sphere. The jumps performed, in particular, are becoming more demanding, incorporating a larger number of spins. Modern figure skating has experienced a major change fairly recently. In the 2004/2005 season, after a controversial assessment at the Winter Olympics in 2002, the original 6 point system was abandoned. At present, the classification system is much more complicated. Each element performed is awarded points separately, by the technical panel and referees independently. Singles include two contests – the short program and free skating. The short program takes up to 2 minutes 50 seconds, during which the contestants must perform compulsory figures (jumps, steps, pirouettes, etc.) the quality of which are judged. The free skate, on the contrary, provides the skaters with more freedom for creativity and their own elements. The number of jumps, steps and pirouettes, however, is prescribed. The duration of the free skate in the junior category, in which the athletes will compete at EYOWF 2011, is four minutes for men, and three and a half minutes for women, with a 10 second tolerance. The Olympic disciplines also include pair skating, where the pair consists of a man and a woman, either in sports couples or ice dancing. 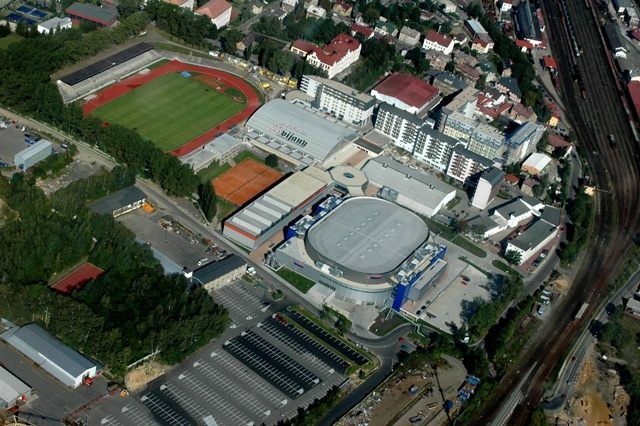 Figure Skating contests will take place in the Svijanská aréna, which belongs to the multi-functional hall Tipsport arena. The entire venue is located near the centre of Liberec, along the motorway leading towards Prague, which makes it easily accessible for visitors. The entire complex provides several sporting opportunities. The predominant feature is the multi–functional hall, Tipsport arena. There are also two ice rinks in the Svijanska arena, an indoor hall, a gymnastics hall, a shooting range, a bowling alley, a softball and baseball field, an athletic stadium, and also a newly-opened cryocentre. The venue includes several hundred parking spaces. The smaller car park (capacity of 177 cars) is partly covered with a roof and, under normal operations, is accessible to the public; if an event is being held, this car park is designated for VIP guests and the organisers. The larger, main car park is located about 100 m from the main entrance and can house over 800 cars and several buses. A three-star hotel Arena with a hostel forms part of the complex. 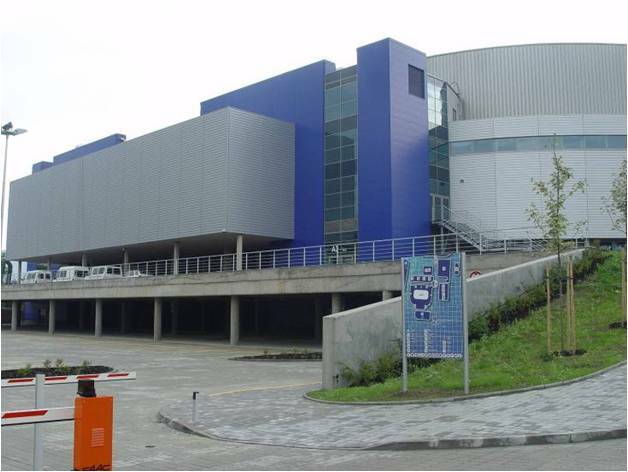 The construction of the multi-functional arena was completed in spring 2005 and on September 8th of the same year, the grand opening of the arena was celebrated. The hall can hold competitions in all of the indoor sports areas, as well as social and cultural events (concerts, exhibitions). However, most frequently the hall is used by the players of the Liberec Ice-Hockey club HC Bílí Tygři. 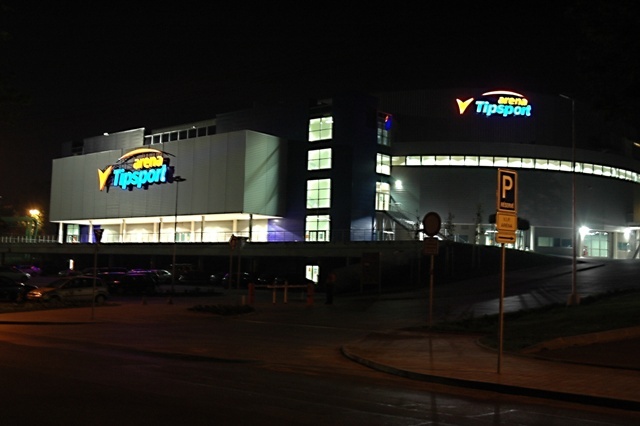 From the very start the Tipsport arena has served as the base for the Liberec basketball players BK Kondoři. Both teams play the highest Czech respective leagues and regularly rank at the top. The hall can seat up to 9,000 people at social and cultural events. For a sports event there can be 7,500 spectators. The arena covers an area of more than 27,000 m2 and comprises of four floors. In the centre, right above the field there is a multi-media jumbotron with four projection screens of 4.6 m diagonal. The ice rink on the first floor of the building is 60 x 26 m in size. This floor features facilities for the players and performers in the form of spacious lockers, a gym, a treatment room, and a doping control room. The operator's main storeroom is housed here, together with the chronometry area, a technical room, and, of course, restrooms. The main visitors’ entrance to the hall, a gallery with several stands, restrooms, and 18 entrances to the auditorium are all located on the second floor. The third floor is divided into 48 skyboxes and restaurants. The fourth floor is designated for the press and media. The journalists have a press office available here, a social area, and approximately 100 seats. This floor also houses the technical back offices. The third and fourth floors are separated by a multimedia strip (ring) leading along the gradin of the entire arena and is 256 m long and 72 cm high. The strip is made from LED technology. The hall meets with the parameters for holding competitions organised by the International Ice Hockey Federation and the International Skating Union. World Championships in freestyle motocross and a tournament of the Euro Hockey Tour – ČP Cup series in Ice Hockey are held here on a regular basis. The Svijanská aréna used to be the main ice rink used exclusively by the local Ice Hockey club. Now the hall has been reconstructed and provides two ice rinks, which Ice Hockey players and figure skaters use for training. This hall was built within the reconstruction of the entire venue and it now provides up to three fields for indoor sports, such as floorball, badminton, and tennis. It also includes ricochet courts. This venue includes a gymnastics hall, a shooting range, a skittle alley, a bowling alley, table tennis hall with several tables, and an aerobic hall used by, among others, judokas. The rotunda forms a connecting link between the buildings, it is a selling point and an information centre at the same time. On the first floor, there is a spacious restaurant seating 250 guests, which is located next to the area in which, during major matches, a VIP restaurant is used, which also seats 250 guests.